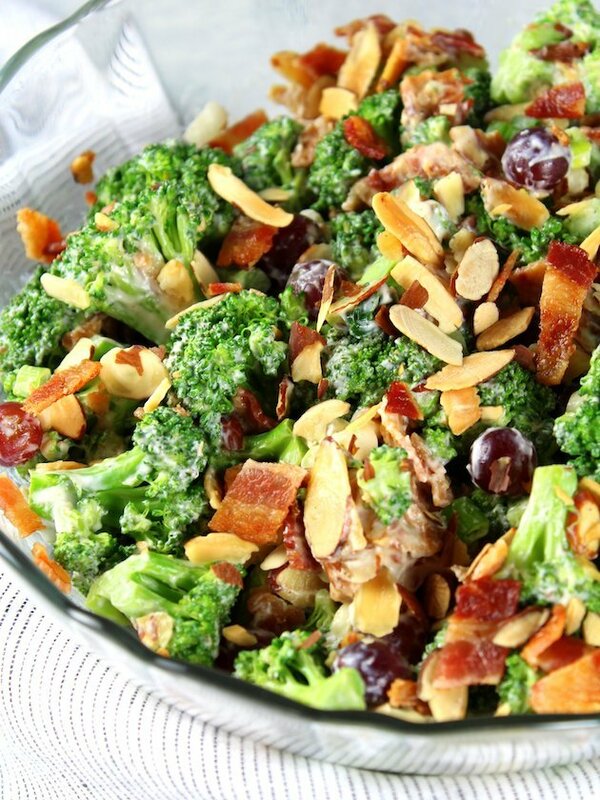 Broccoli Salad with Grapes and Bacon – a delicious salad that can even double as a meal. 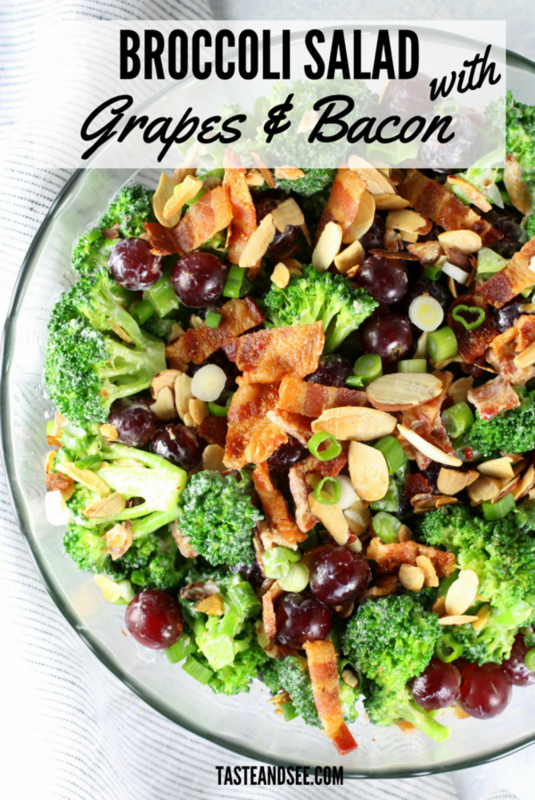 With blanched broccoli, red grapes, sliced almonds, green onions, yummy bacon, and the most delicious creamy dressing! This Stealthy Healthy side dish will definitely be on repeat in your weekly meal plans from now on. 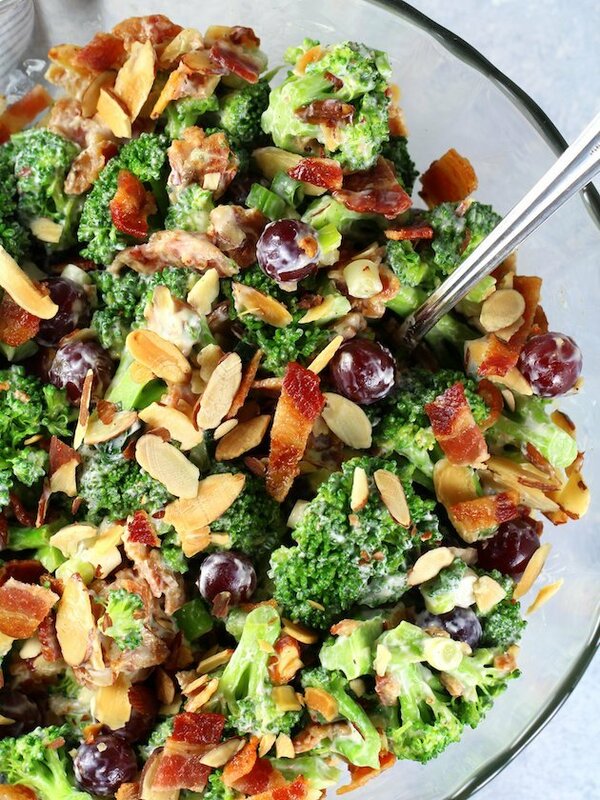 What are your thoughts on Broccoli Salad?? It seems to be one of those dishes that people REALLY love. 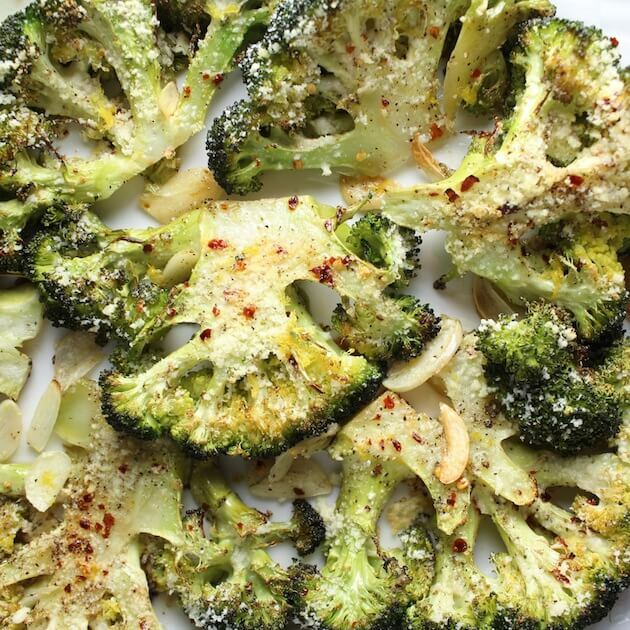 After all, it’s broccoli – the most popular, family friendly veggie on the planet. Which is a huge win all the way around ‘cause it’s SO good for us. 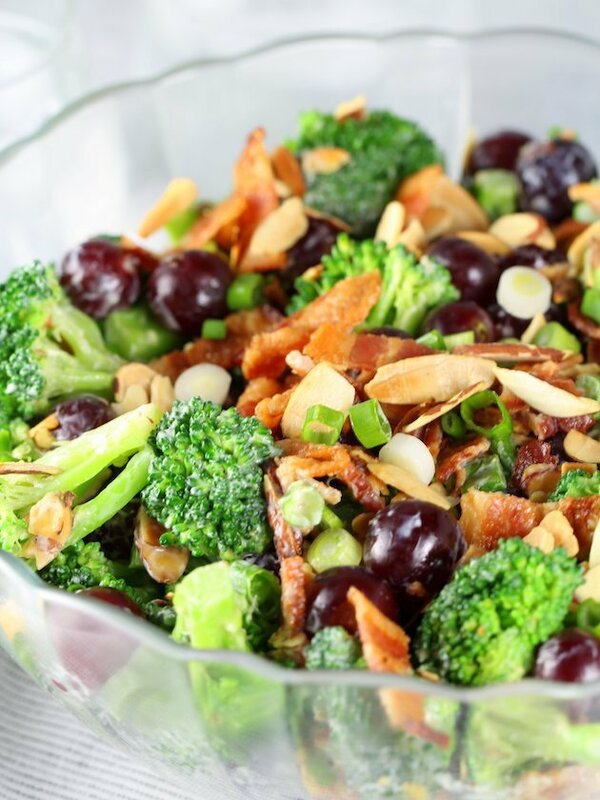 And that’s just one of the reasons why I’m crazy about this Broccoli Salad with Grapes and Bacon! Some crunchy nuts, sweet fruit, a tangy sweet dressing, and boom! Addictive deliciousness, please get in my belly. Amiright? I decided to create my own rendition of this ever-popular veggie side dish. 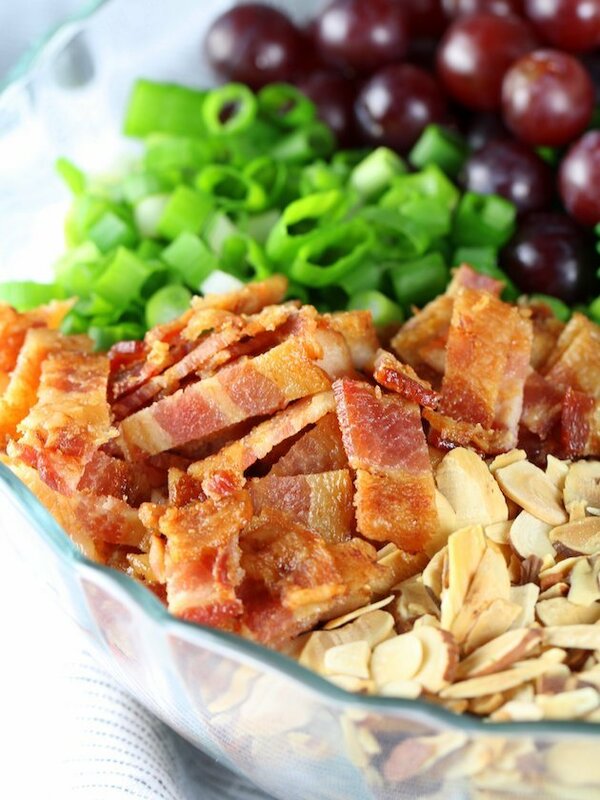 And I decided to add fresh grapes for my fruit, toasted sliced almonds for my crunch, and bacon, ‘cause… BACON!! My girlfriend Jaime ask me to crack the code for the Chick Fil A Superfood Salad a while ago. I have to admit I’d never had their superfood salad, but since I love a good food challenge I scooted on over and ordered one to go. It had lots of kale, a little tiny bit of broccolini, some sweet and tart cherries, and the most interesting dressing. It was sweet for sure, with some vinegar… but it had this aftertaste I couldn’t place. I was feeling pretty confident I could crack this code and take it to a whole ‘notha level! Sooo I went to work. And well, I have to report this isn’t really their salad… but it’s mine – and now it’s yours. I just know you’re gonna love it! It’s pretty amazing. Salty, sweet, crunchy, creamy, filling and just so delicious. Ahhh now I get it! I may be a “Broccoli Salad Newbie,” but I’m a believer all the same! I’m not gonna lie: it’s actually kind of addictive. I have to put a portion on my plate and put the rest of the salad away, so I don’t just stand there and eat the entire bowl. And all you BSB’s (Broccoli Salad Believers) are nodding in agreement – aren’t you? Allow me to share my process for making this delicious and nutritious broccoli salad! This first step may seem a little different than most recipes you’ve tried. I actually like to blanch my broccoli. And although it takes a few minutes longer to heat up the water, it’s totally worth it. You still get all the liver-cleaning enzymes and other healthy benefits but you also get a more tender and moist veggie. And according to Heathy Eating it may be the best way to eat broccoli! 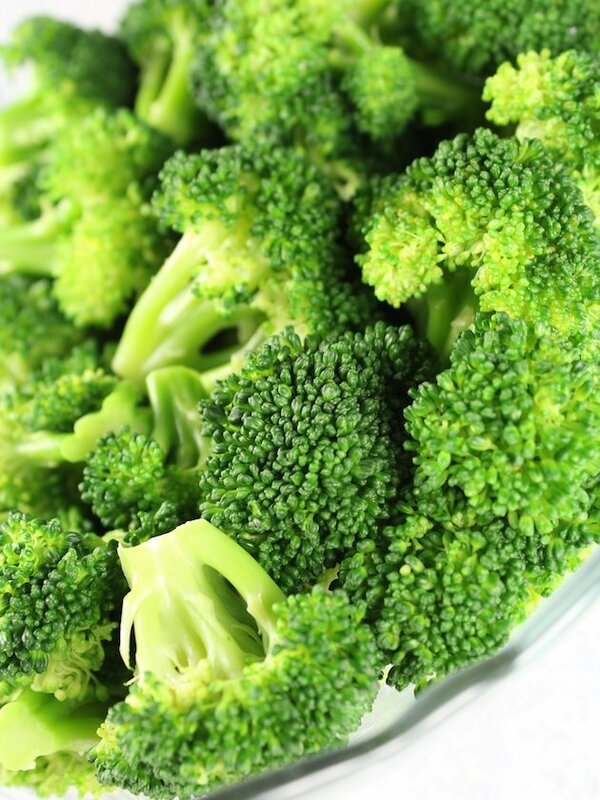 Here’s the deal: raw broccoli can be difficult for some people to digest due to the sugars it contains. And it can cause unpleasant side effects like gas and bloating. Also, raw (uncooked) cruciferous vegetables contain thyroid inhibitors that can worsen thyroid conditions. Hmm, good to know and just so interesting – right!?? 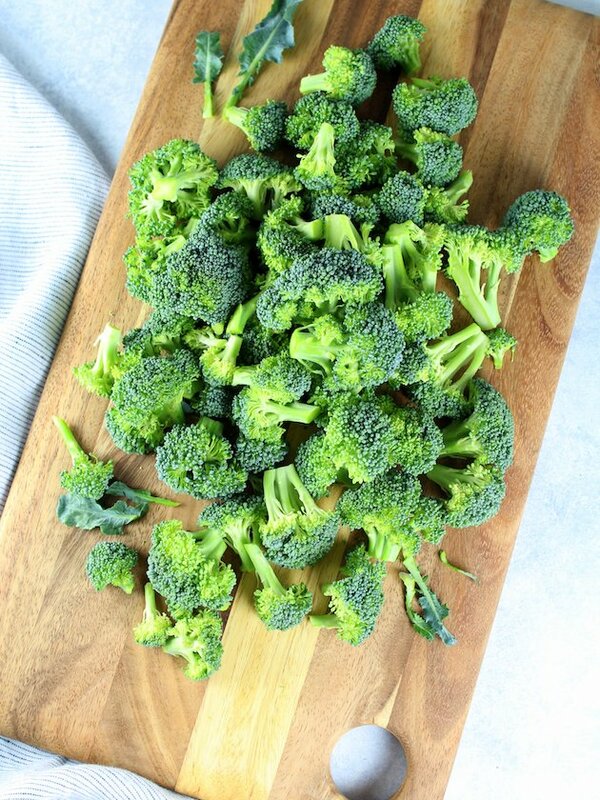 Blanching the broccoli is actually a relatively quick process. Just heat a large pot of water on the stove until it boils. Drop your broccoli florets in there, stir for about 30 seconds, and then dump the pot into a strainer and let the broccoli cool. Next, mix up the sauce in a large bowl: Greek yogurt, mayo, olive oil, cider vinegar, pure maple syrup (or honey), salt, and pepper. 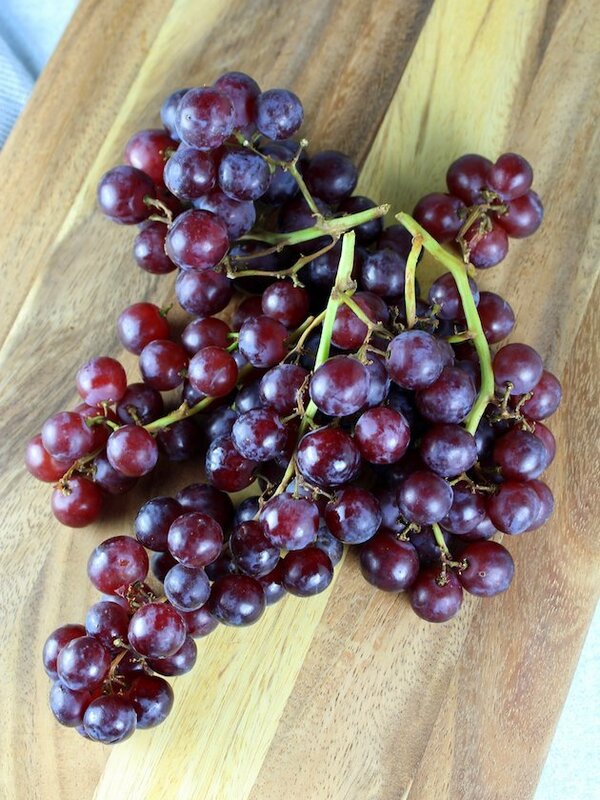 If your grapes are small like mine, you don’t need to cut them. But if they’re larger, you should slice them in half. 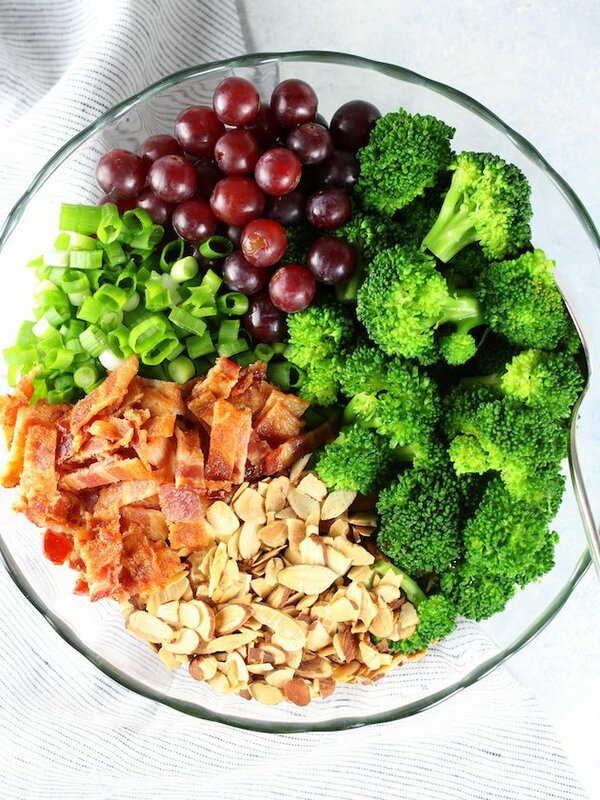 Now it’s time to assemble: add your cooled broccoli, grapes, green onions, most of the almonds and bacon to the large mixing bowl with your sauce. Fold it all together and be sure everything is coated in the sauce. Now sprinkle the rest of the almonds and bacon on top and if you can stand it, cover and chill it for about an hour (or longer) before eating. Yummy, yummy in your tummy! It’s just the most delicious salad that can even double as a meal. This Stealthy Healthy side dish will definitely be on repeat in your weekly meal plans from now on. 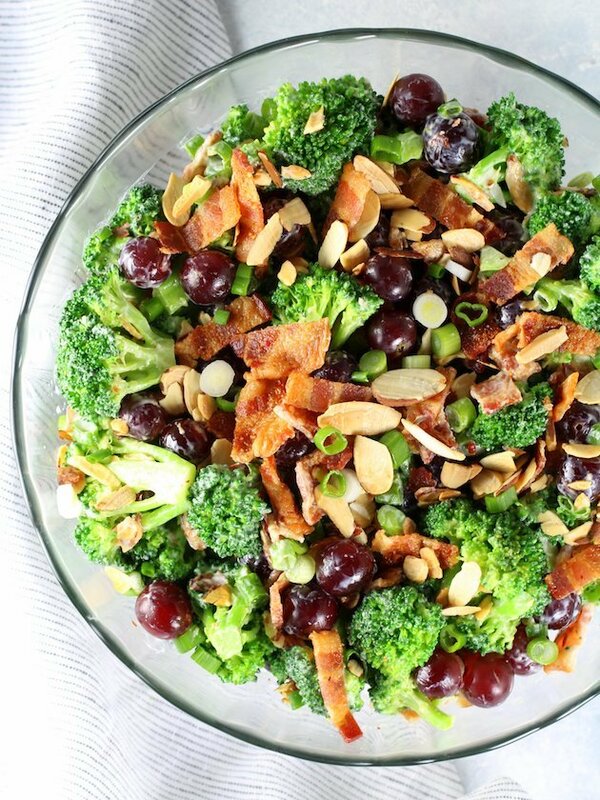 And you’ll be taking this tasty Broccoli Salad with grapes and bacon to potlucks, picnics, BBQ’s and all your family get-togethers! I can’t wait for you to try it! Enjoy my friend! I would love to connect with you! Leave me a comment and follow me on Facebook, Instagram, Pinterest, and Twitter! 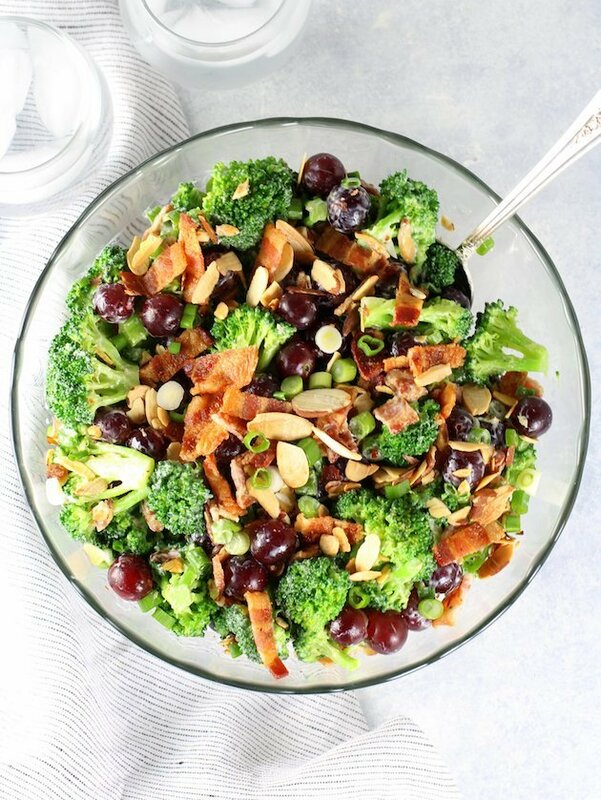 Broccoli Salad with Grapes and Bacon - an updated rendition of the classic with crunchy nuts, sweet grapes, and a tangy sweet dressing. To blanch the broccoli: Boil a large pot of water, then drop broccoli florets in and stir so all the broccoli gets submerged. When the broccoli changes from a dark green to a pretty bright green (about 30 seconds), pour into a strainer in the sink, then set aside. In a large mixing bowl combine mayonnaise, olive oil, Greek yogurt, vinegar, maple syrup, salt and peppers. Stir well. 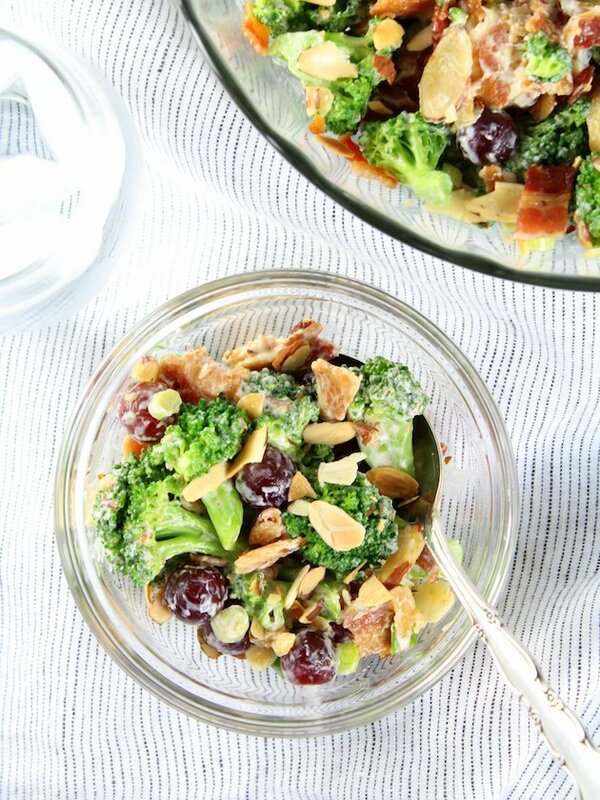 Fold in the broccoli, grapes, green onions, 1/3 cup of the almonds and three-fourths of the bacon. Once completely combined, sprinkle the rest of the almonds and bacon on top. Cover and chill 1 hour before serving. *If you're not a fan of mayo you can swap it out for extra virgin olive oil. The dressing will still be good just a little thiner. 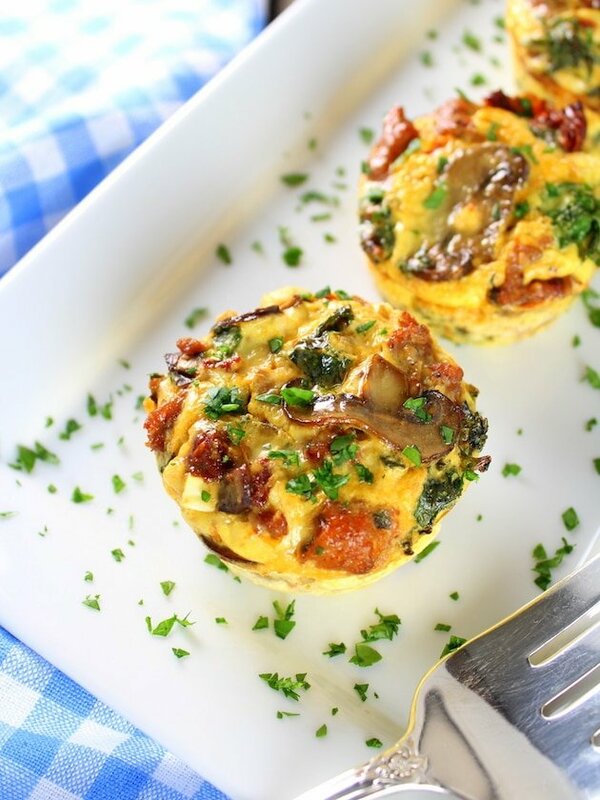 Looking for more Easy Healthy Recipes?